If it seems like this whole Summer is filled with significant energies and dates and aspects to be aware of and meditate on and allow to run through you...it's because there really truly is! Ha-ha! That's right, we've got some major stuff going on right now annnnnnnnd I have recently, just in the last 6 months discovered a really wonderful tool that I haven't talked about much. I think the time is ripe to discuss this now since we have a New Moon coming up on the 9th (for North and South America) (the 10th for Europeans and Australians). New Moon's are very fertile and represent New Beginnings so, New Moon's are a great time to set an intention, to 'plant' a new seed of possibility, or to just be aware that a new 28 day cycle is starting and to intend to co-create this cycle to be of the highest possible vibration for you, your friends and family and for the World itself. Back in February my good friend, Marjie, here in Mexico said, "We should do a ritual for the New Moon!" and I said, "OK....maybe we should do a ritual for each part of the moon's cycle just to keep us on track and focused? For the New Moon, First Quarter, Full Moon and Last Quarter?" It was a deal. I said that I'd look at the western astrological and the mayan dreamspell energies for the day and perhaps that would inspire us as to what we would 'create'. She said that she'd see what ideas bubbled up into her consciousness over the next week before the New Moon coming up. On February 13, 2010 our very first Ceremony was born! For, this is what it ended up being...a fully fleshed out, amazing Ceremony, spontaneously created just for that day by both of us! It ended up being a White Spectral World-Bridger day and, of course, without even knowing this Marjie had come up with her idea and that was to Let Go of everything that wasn't serving us....I was like: "Wow, you're plugged in, baby!!" Because it was a triple whammy Letting Go day because both Spectral and White World Bridger energy are about dying to the old and letting go, forgiving and releasing. The triple part of the whammy was the fact that Pluto and Saturn were opposing each other. More death-of-the-old-to-make-room-for-the-new energy! We were in sync. This was going to be a good one. Our very first ceremony was long (almost 4 hours!) because we wanted to include so much! We started with the White Spectral World Bridger letting-go energy - so we wrote down everything that we wanted to let go of in our lives...to release into forgiveness. After that was done we went our separate ways looking for an inspired way to release them into the ocean. (I tore my list up and put the pieces in a coconut husk, filled it with sand and then stood on a favourite boulder and, with lots of intention and powerful thoughts, hurled it into the dynamic ocean which tossed it and battered it against other boulders and emptied it pretty quickly! Ahhhh Release!!!) After all this release and surrendering to the perfection of what is we felt emptied and fresh and new just like the New Moon herself and we went about collecting beautiful little natural items that represented the gifts and talents we were born with and which would naturally, through the process of entelechy, blossom beautifully as they were meant to. Our idea was to re-plant these within the fertile soil of our Selves and, with intention and trust, allow and expect ourselves to Bloom. The Yellow Seed year was supporting us with this as was the other astrological aspect of the day: Jupiter/Venus in Pisces. After this we sat and Marjie took us through the chakras toning and then we meditated. What was super-crazily-mind-blowing was just how much changed in my life within the next 28 days!! (The cycle through New Moon to First Quarter to Full Moon to Last Quarter and back to New Moon) I was stunned. Just a week later, during the First Quarter, my boyfriend broke up with me (!?). Letting go, releasing, forgiving. OK. It was unexpected but clearly had to be done. Then within that same Moon cycle at the Last Quarter my long desired dream of building my house all came together!! I honestly can't believe it. (present tense!) I had bought some land a year and a half earlier and had been thinking that I really did need my then-boyfriend to help me get my house built so I was waiting for us to get quotes together (which meant he had to have time to find builders etc). Before the New Moon Ceremony I had really thought that I could NOT build my house without him. Sooooooo the fact that I had a brilliant idea and found the perfect builder all on my own was....wowwwww...a total surprise and, of course, now with 20/20 hindsight I see that this is exactly the way it had to be: Me doing it on my own. If i had to be dependent on an other to build my house the dream I had of being fully absolutely involved and engaged in the process would not have been fulfilled! Isn't that wild?? I mean, woah, POWERFUL stuff!!! I have also been writing a lot more and using my talents and gifts much much more...!! Oh I forgot another incredibly cool thing! Just days after we did our first New Moon ceremony (but before my boyfriend broke up with me) I got an email from Jean Houston's website - it was advertising a workshop that was coming up at the end of March on....hold on to your hats!....CEREMONY!! I am serious! What are the chances? Honestly - before we did our first ceremony I really did not resonate with the idea I had of 'ceremonies'. Anyway - I looked at the email marvelling at the synchronicity and noted that the workshop took place in New York - cool, but nope, I wasn't going. Of course not. But, right after the break up I was scrambling to find something that could replace the empty, heart-breaking feeling I had and, being a Sagittarius Travel is the first exciting thing to come to mind so I thought: perfect! I'll go to the Jean Houston workshop (I admire her SO much - she is amazing and inspiring and she's Alive! That might sound weird but I tend to really admire writers, artists, philosophers that aren't around anymore!) AND I'll visit my fabulous friends in New York City - all three that I met when I lived in Prague in 93/94) So I bought my ticket to NYC and signed up for Jean's 3 day workshop in the boonies all within that first New Moon cycle, too. Crazy eh? We could all be aware of our dreams and see what bubbles up from our subconscious selves in the next couple of days so that we have something more to work with with when the next New Moon is upon us. Ooooh I'm quite excited about this New Moon now! I am going to fill it chock full with goodies and see what happens...see what grows out of it. It's so interesting because it really is just all about putting energy into something, ya know? The more energy you put in, the more you get back. Energy follows Thought. And we're learning just how powerful and beautiful we all are! Ceremonies are wonderful, energizing containers for our thoughts, dreams and intentions for not only ourselves but for the world, as well. 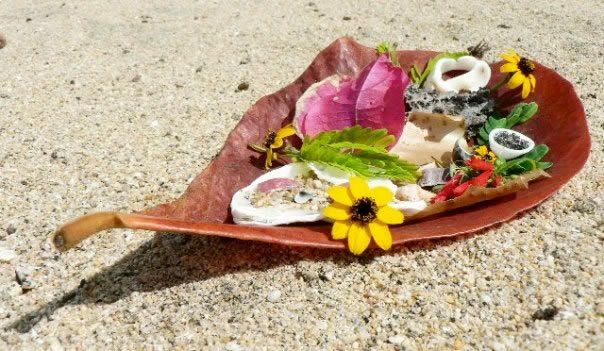 Part of our ceremony consisted of burying ourselves in the sand at the ocean's edge and then being washed over by the purifying waves then kneeling for a long, glorious time in meditation while the waves washed gently and then more fiercely over us. Wowwww. I remember it feeling so natural at the end to lean forward, stretching both my arms out in front of me, pressing into the sand with my hands until I was kneeling and outstretched...my heart was filled with total gratitude to the earth for having me! Thank you thank you thank you beautiful earthly Earth! This pose was pure love of this gorgeous physical world! Marjie filled me in on the fact that my pose WAS, in fact, the Gratitude pose! ha! Well, now I know why! I just had to have a fire with the starry stars above me igniting harmony in my heart! Wow, we created a stunning ceremony for this New Moon. A square for stability and the 4 directions was drawn in the sand then a heart within that (for Yellow Warriors Hearts Desire) - then we decorated our respective hearts with flowers found round and about and then we sat in the middle facing south and meditated. Marjie, followed her inner promptings to spontaneously take us through some poses and there, arched back in the middle of my heart, I felt a whole bunch of popping-releasing sensations coming from my Solar Plexus area....in my minds eye I saw all these 'hearts desires' that I didn't even know existed (just like I didn't know I'd want to live in Mexico before I was guided to come here!) being seeded around me. Ooooh so exciting. New possibilities that hadn't even occurred to me yet! Open to new heart's desires! Of course, part of our ceremony included playful hopscotch on the beach! We also poked blue jellyfish with sticks. :) Hahaha. If you like this you'll really want to read this page about how to combine your ceremonies with Wavespells and the Lunar Cycle!